Beans and other legumes have extraordinary nutritional properties. They are a great source of protein and minerals (iron, calcium and more) and, when combined with food grains, are a really complete dish for a perfect functioning of your body. Molino di Borgo San Dalmazzo’s dehydrated beans, lentils and peas are a perfect ingredient for your soups and salads, or a great side dish to the main course. A mix of 4 different varieties of beans, along with spelt and barley. Ingredients which create dishes with amazing aroma and unique flavor, perfect to ret the right atmosphere in the dining room. Zuppa Contadina of Molino di Borgo San Dalmazzo is perfect for creating simple, rustic and balanced dishes. 4 kind of beans, spelt and barley. 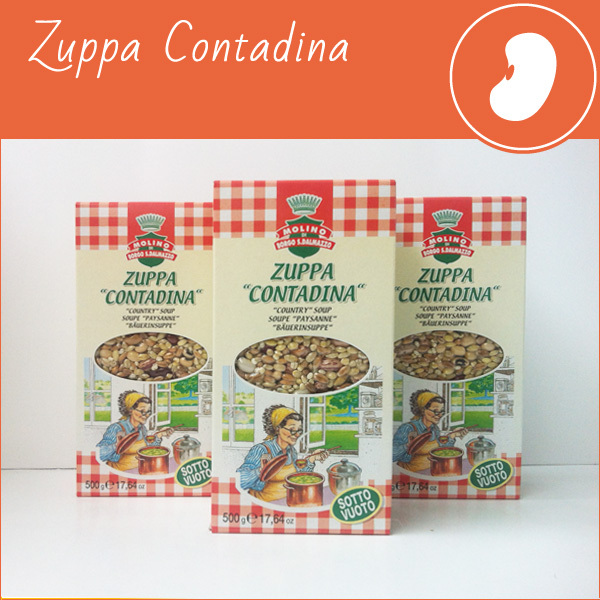 Zuppa contadina is made by dried beans, so leave the content of the package plunged in water for 5 or 6 ours before cooking it. Molino di Borgo San Dalmazzo’s Mixed Lentils and Barley Soup combines the extraordinary properties of peas, lentils and soy to those of barley. Legumes are rich in proteins with a medium biological value, deficient in certain essential amino acids which, however, are present in cereals. That’s why legumes and barley together are a perfect match for a truly balanced diet. Green and red lentils, soy, barley, peas. The Mixed Lentils and Barley Soup is made by dried beans, so leave the content of the package plunged in water for 5 or 6 ours before cooking it. 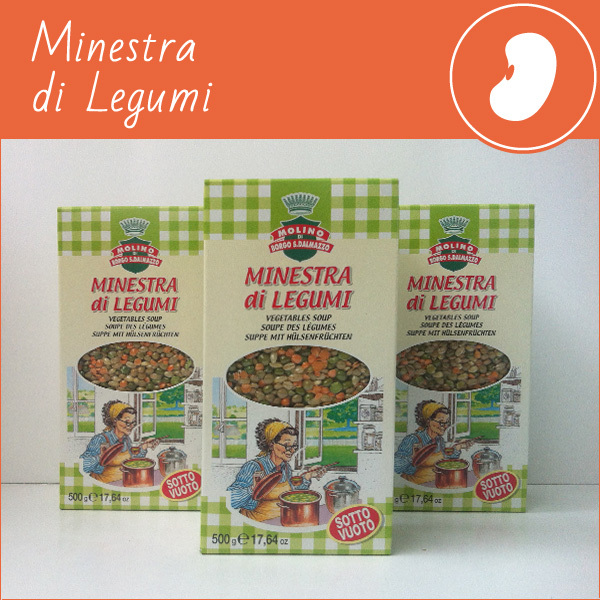 The Minestrone della Nonna by Molino di Borgo San Dalmazzo combines the extraordinary properties of peas, lentils and soy to those of barley and the intense flavor of the beans. The result is a tasty and easy to cook dish. Legumes are rich in proteins with a medium biological value, deficient in certain essential amino acids which, however, are present in cereals. That’s why legumes and barley together are a perfect match for a truly balanced diet. 4 different kind of beans, peas, red and green lentils, barley, soy beans. 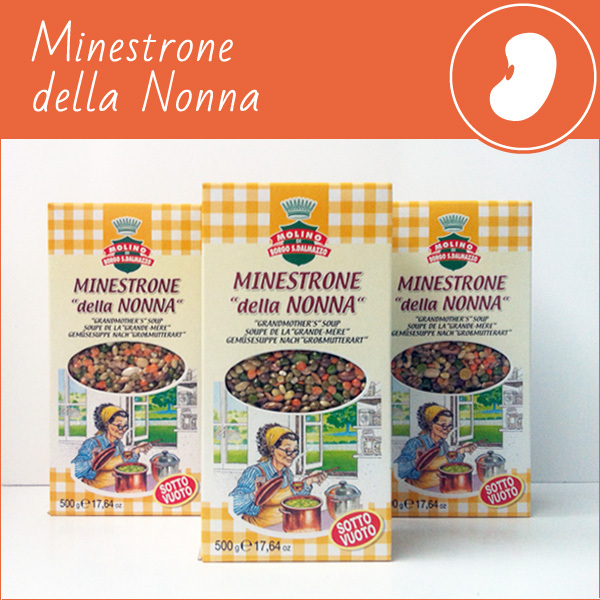 Minestrone della Nonna is made by dried beans, so leave the content of the package plunged in water for 5 or 6 ours before cooking it. Borlotti Beans are characterized by a light brown color and dark red streaks. With an intense and full-bodied taste, this type of bean is very suitable for the preparation of every kind of soup. 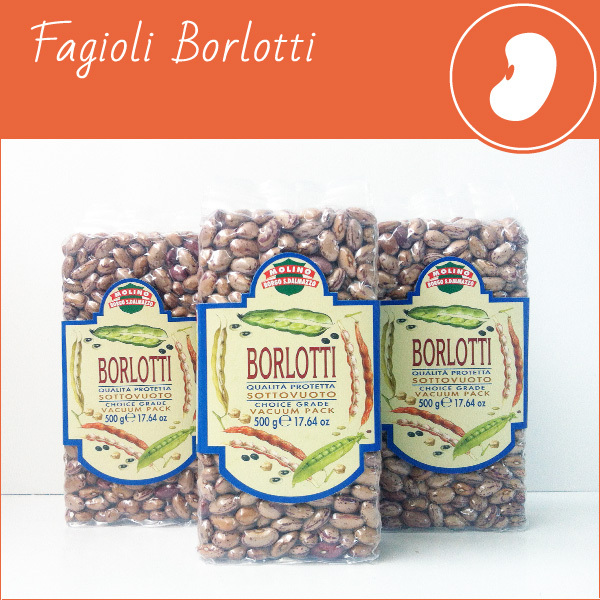 Like all legumes, Borlotti Beans have a high nutritional value and are high in protein, fiber and lecithin. These Borlotti Beans are dried, so leave the content of the package plunged in water for 5 or 6 ours before cooking it. Cannellini is a fine variety of beans, light gray (almost white) colored. 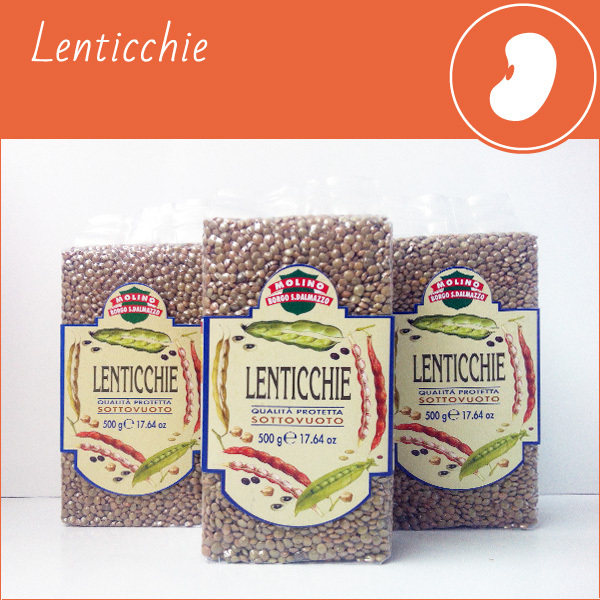 With his delicate taste, this type of bean is particularly suitable to prepare salads or stews. 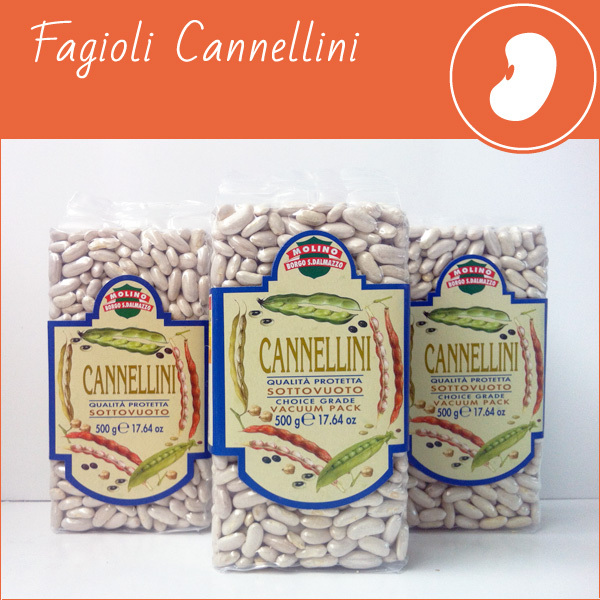 Like all legumes, Cannellini have a high nutritional value and are high in protein, fiber and lecithin. These Cannellini Beans are dried, so leave the content of the package plunged in water for 5 or 6 ours before cooking it. Green Lentils are a classic in Italian cuisine: as side dish for most traditional main courses, or as a great base for delicious soups. But also mashed, in soup, in salad and steamed. Like all legumes, lentils have a high nutritional value and are high in protein, fiber and lecithin. These are dried green lentils, so leave the content of the package plunged in water for 5 or 6 ours before cooking it. Molino di Borgo San Dalmazzo Mixed Beans is an incredibly full meal by its own, as it combines the properties of peas, lentils and soy to those of barley, beans and chickpeas. It is also enriched with five different varieties of beans. A mix of health, taste and color! Green and red lentils, green peas, 5 kind of beans, green soy, barley, chickpea, broad beans. 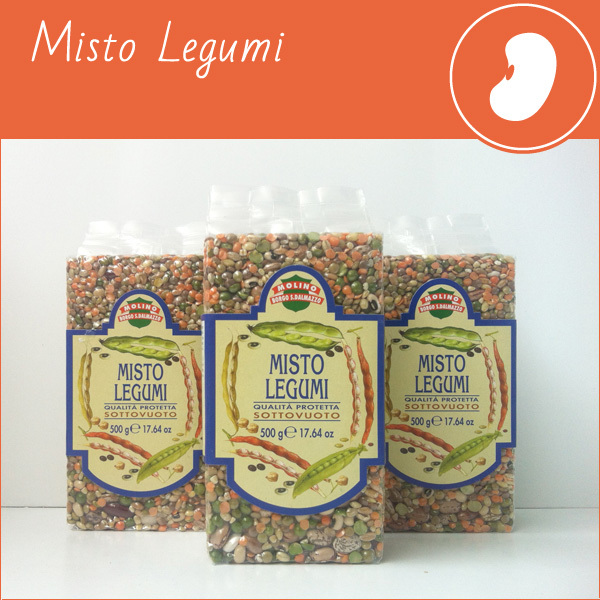 Misto Legumi is made with dried beans, so leave the content of the package plunged in water for 5 or 6 ours before cooking it.